Over Thanksgiving, we were not only busy with Pie-fest (evidence found here and here) but we also decided to take on Black Friday shopping and a Christmas craft project. One of the three had a serious consequence on my bank account (I’m that sucker that equates 50% off to mean ‘I can buy twice as much!’). Most good people see Black Friday as a chance to swipe deals on Christmas gifts for others… I am a heathen. After our early morning shopping, we decided the best thing to do would be to change into our sweats and commence the Christmas decorating/crafting! 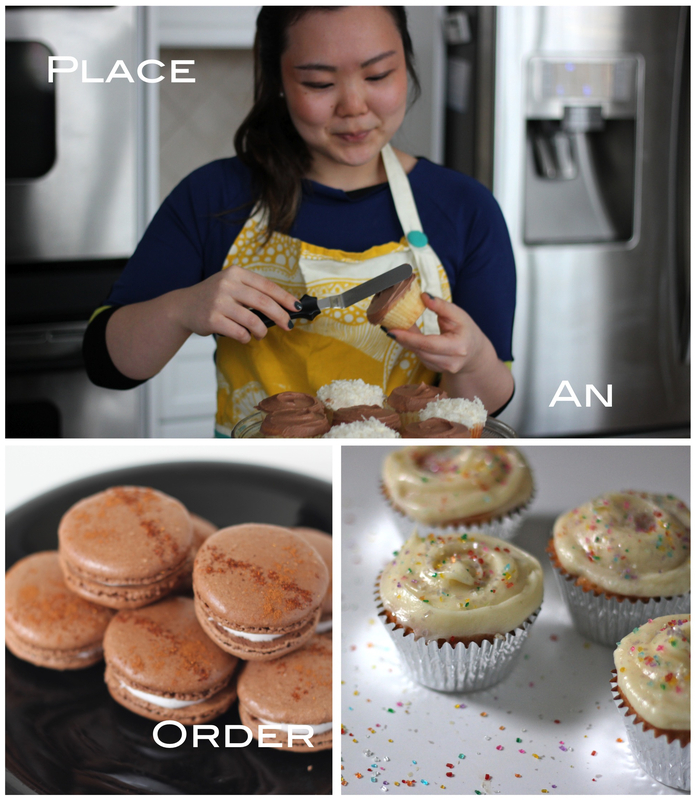 This project is a Martha Stewart creation so of course, I immediately loved it. We adapted the instructions a bit, though, because my parents prefer not to have too many holes nailed into their front door. Here’s the step-by-step process of our Christmas crafting… with the final beautiful result at the end! 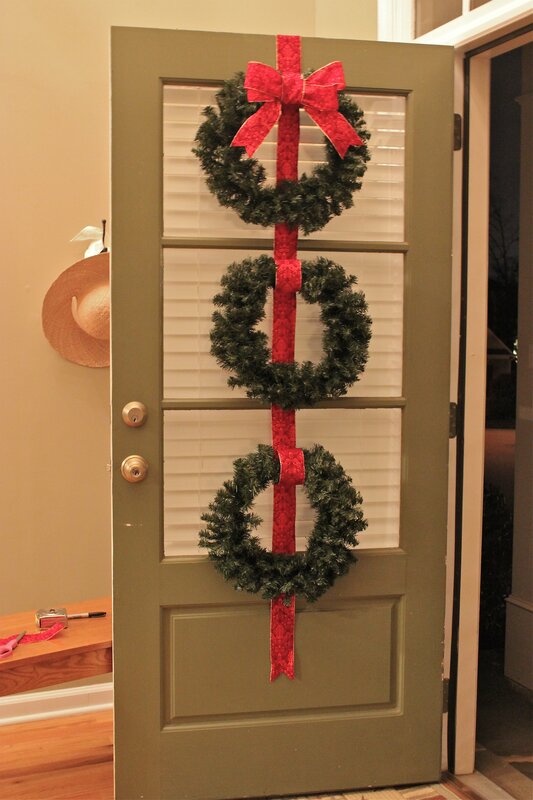 (1) Attach a 6-7 foot (depends on height of your door) ribbon length at top of door with a strip of tape. Fold the bottom end of ribbon in half lengthwise, and snip at an angle to create a notch. 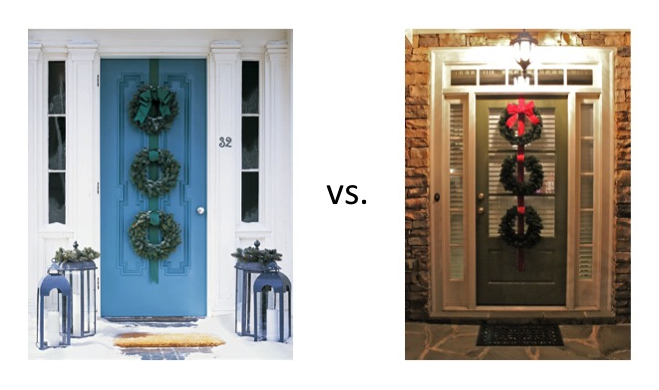 (2) Hold wreaths up to ribbon to determine desired positions. Mark positions on ribbon with marker. Attach each Command Strip at each mark, behind the ribbon. Gently cut a cross-shaped slit at the marks made on the ribbon so that each hook can poke through. 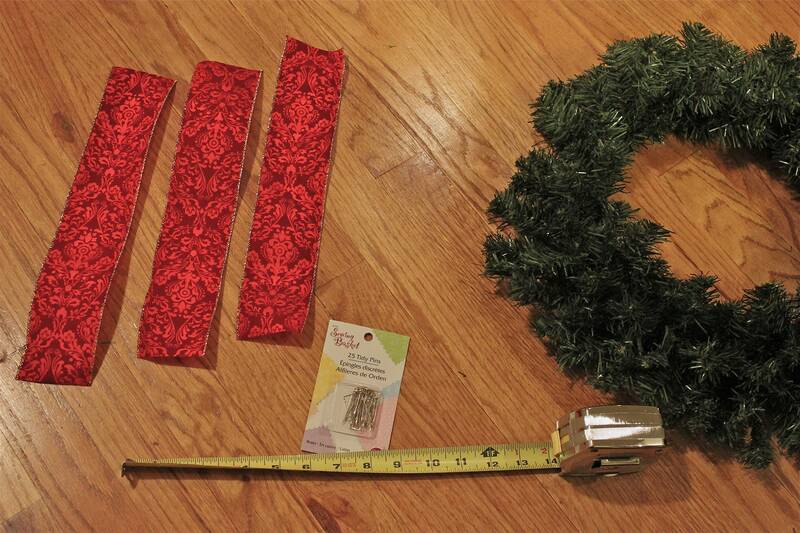 (3) Cut three 1-foot ribbon lengths to wrap around the top of each wreaths. (4) Fasten at back with U pins. Cut a horizontal slit on the back of each ribbon. 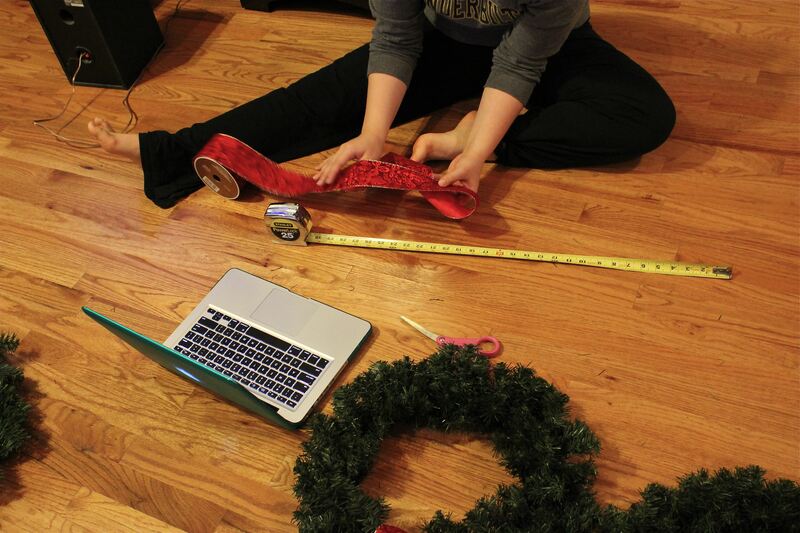 (5) Take 2 yards of ribbon and make a bow for the top wreath. Sadly, Martha does not give very good directions for this. I just kinda folded the the ribbon back-and-forth and stapled the center. I then took another 6-inch piece of ribbon, wrapped it around the center and stapled it twice in the back. Once the bow is made, attach to a wreath, securing with a U pin. 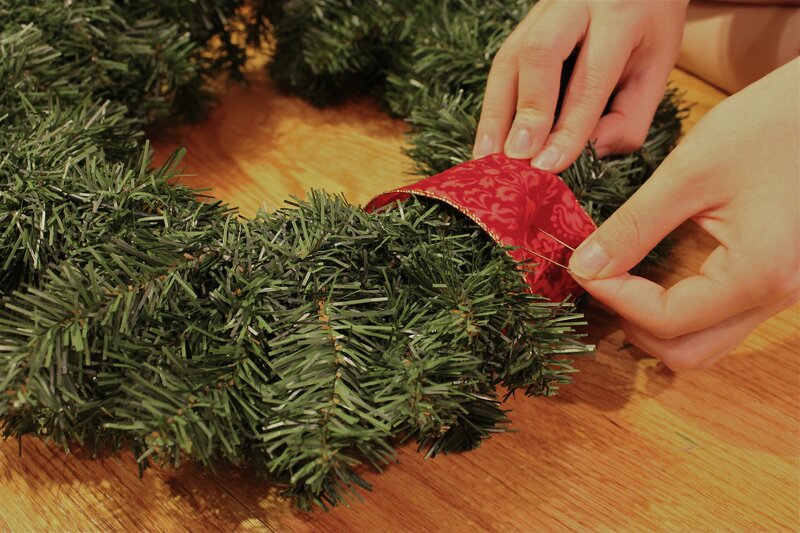 (6) Hang onto the hooks through the slit cut on the back of each wreath. Look back and admire your instant Christmas cheer! So, WHO WORE IT BEST? ?